Yesterday the Australian government (with the PM and three cabinet ministers in attendance) announced that it’s going to split ASC  into three separate but still government-owned companies, to ‘support the key capabilities of shipbuilding, submarine sustainment and infrastructure’. It was heartening to see some movement on the issue. It’s vitally important that government gives serious thought to the industrial arrangements for projects that will cost the taxpayer tens of billions of dollars—something we noted last year . At yesterday’s announcement, the government was at pains to note that it ‘does not have a plan to privatise these three new companies’. So what’s been gained and lost by the split? On the positive side, the newly created businesses will be able to focus single-mindedly on their respective specialisations. And the separation will provide greater public transparency into the business performance of the three components (though the government won’t necessarily see that as a benefit). On the negative side, we’ll see corporate overheads (including board positions) multiplied by three. At the same time, interactions between the three newly created companies will generate additional transaction costs . Where once an internal company memo would suffice, a legal contract will become necessary; and where sharing of human resources between business units was once possible, now there’ll be competition for talent. … very clear. This is a strategic asset of national significance and it is explicitly the Government’s intention to maintain the infrastructure business and infrastructure assets in Commonwealth ownership. By owning the infrastructure, the government can then sell the other businesses, leasing out the facilities to users as required. That’s smart, inasmuch as it allows the government to retain the option of competition for future projects, rather than granting monopoly control of core naval maintenance and construction assets to a single commercial entity in perpetuity. That’s why the Commonwealth retained ownership of the facilities at Garden Island in Sydney. It’s interesting that yesterday’s announcement made no mention of submarine building. That’s probably because there’s no submarine construction at the moment, and likely won’t be for some years, given that the contract with DCNS for the commencement of the design phase for the future submarine was signed only two weeks ago . By retaining ownership of the infrastructure in Adelaide, the government now has the option of simply letting some space to DCNS for the construction phase, rather than once more going into the submarine building business itself. And it can also opt to move the now separate submarine sustainment business to Western Australia (where ASC already has a maintenance facility) if space at Osborne is at a premium. The ways ahead for the Future Frigate and Offshore Patrol Vessel (OPV) programs are less clear, though competitive evaluation processes are underway for each. It’s not simply a matter of choosing designs; that’s the easy part. The real challenge will be to put together an industrial and commercial package that delivers value-for-money to the taxpayer (also true for the submarines). The government has promised a continuous major warship production program for South Australia and a continuous minor warship program for Western Australia. It remains to be seen how the government will achieve efficiency from the two long-term monopoly shipyards it plans to create. Given the substantial political power we’ve seen exercised by the South Australian shipbuilding lobby over the past 20 months, the government will begin negotiations on the back foot. 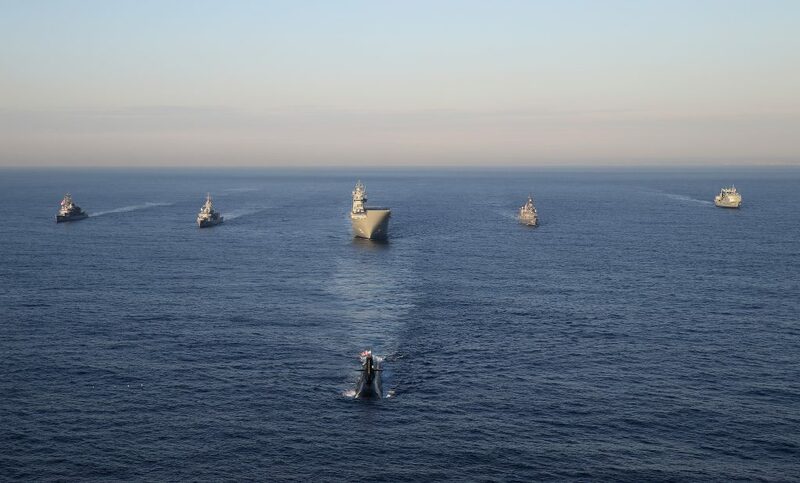 To further complicate matters, the OPV production program is planned to commence in Adelaide (to provide a gap-filler between the AWD and Frigate programs) before shifting to Western Australia to retain skills in the South Australian yards. Unless a single firm wins both contracts, it’s unclear how the split OPV program will be managed. And it again raises the question of ownership. Workforce continuity would most easily be achieved by either awarding the gap-fill OPV and Future Frigate contracts to the newly created ASC shipbuilding spin-off, or selling the newly created shipbuilding spin-off to whichever firm wins the Frigate contract. Whether the government keeps the new businesses it created or sells one or more is irrelevant from a financial perspective. The government’s the only likely customer for the activities in the South Australian shipyards. So, either way, the net result is a flow of money from the government to the private sector. Think of it this way: any firm that buys a naval shipbuilding business from the government is really just lending the government money temporality. The crux is really how well the entire enterprise is managed. And, in the long term, private sector ownership is likely to result in better management. Yesterday’s announcement at least showed that the government is thinking about it and creating options for moving ahead. If nothing else, that puts us ahead of where we’ve been for much of the past decade. Andrew Davies is senior analyst for defence capability and director of research, and Mark Thomson is senior analyst for defence economics at ASPI. Image courtesy of the Australian Department of Defence.